The world's longest cross-sea bridge, spanning Jiaozhou Bay of Qingdao in East China's Shandong province, opened to traffic on Thursday amid a major effort to further consolidate this coastal city into an international shipping center for Northeast Asia. 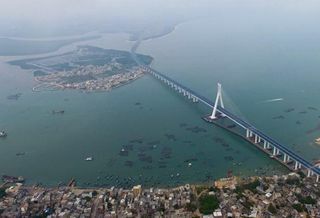 The 41.58-km, eight-lane Qingdao Jiaozhou Bay Bridge, connecting the urban district of the city to its Huangdao district, cost 14.8 billion yuan ($2.3 billion). Construction started in May 2007. The bridge will shorten the route between the two centers by 30 km, cutting travel time from more than 40 minutes to about 20 minutes, said Han Shouxin, deputy director of the city's traffic management committee. 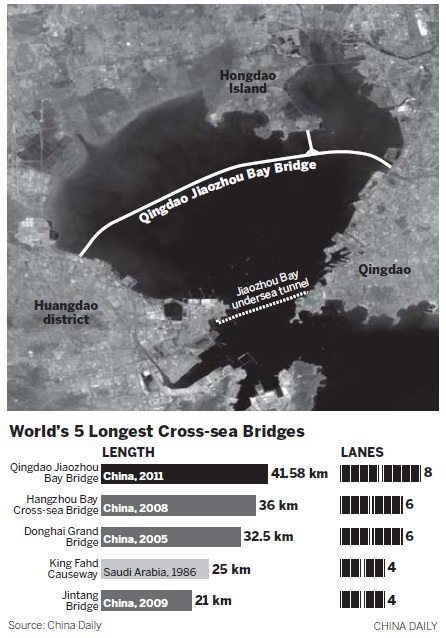 Previously, the longest cross-sea bridge in the world was the 36-km-long Hangzhou Bay Cross-sea Bridge that connects the cities of Jiaxing and Ningbo in East China's Zhejiang province. "The bridge has been a long-time dream for Qingdao residents," said Qingdao Party Chief Li Qun at the inauguration ceremony. 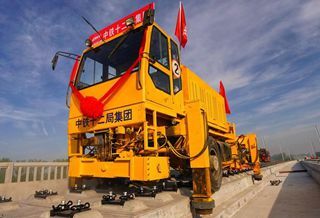 He said the bridge will greatly improve travel from the eastern tip of Shandong's Qingdao, Yantai and Weihai, through central Shandong's Rizhao, Linyi and even to the northern areas of neighboring Jiangsu province. It makes the one-hour economy ring for downtown Qingdao and its surrounding districts a reality and strengthens the prospect of a four-hour economy ring among cities on the Shandong Peninsula, Li said. Guan Hua, a 30-year-old woman at a local shipping company, was excited about the bridge. "I have to travel back and forth between Huangdao and downtown and other places in Qingdao for work and sometimes for fun with friends," she said. "It was annoying to have to fight the downtown traffic for the expressway entry to reach the destinations. "In addition, traveling will be more pleasant with the sea views from the bridge," she added. Sixty-one-year-old Yu Zhong'ai, from Xuejiadao community of Huangdao district, said he had to spend nearly three hours traveling from his place to visit his daughter in downtown Qingdao. "But with the bridge I will save at least one hour," he said. The bridge was built in four years, with several world records and national prizes achieved. Before that, it took more than 17 years for the authorities and experts to finish the exploration, planning, design and bidding for the project. Zhou Fengjun, an academician with the Chinese Academy of Engineering, said: "A hard part has been that we have had to work out techniques to cope with the high salt content and winter ice in the seas of Jiaozhou Bay, which otherwise would damage the structure of the bridge." Huangdao district, also known as Huangdao Economic and Development Zone of Qingdao, was among the first national development zones approved in the early 1980s. Last year the gross domestic product of the zone stood at 100 billion yuan, with its per capita GDP reaching $25,000. The zone connects the Shandong Peninsula to central and western areas of the province. Thursday also saw the opening of the nation's longest undersea tunnel, also linking downtown Qingdao to Huangdao. The 9.47-km tunnel provides a fast link between the two areas. Wang Shengfu, a mini-bus driver from Qingdao Chengtou Group, was excited about the bridge and tunnel. "My job means I often travel back and forth. 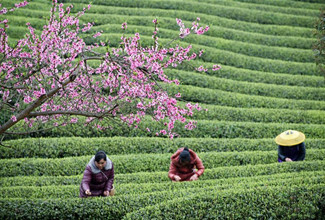 Now I have more choices in finding the best route," Wang said.